A healthy range of six Huski skid steer loaders are available nationally from Toyota Material Handling , from the 4SDK to the 900kg operating load 5SDK11 - the largest model in the 5SDK skid steer loaders range. The Toyota Huskis are available for customers to order directly from the factory with a range of control options to choose from, including ISO control steering pattern (foot pedals not required) and 'H' pattern, and some of the special features in the Toyota 5-Series Huskis skid steer loaders include an optional push button for 'ride control' to avoid fore/aft pitching when these loaders are in transit. Frank Fallowfield of F & R Fallowfield Excavations and previous owner and operator of the earlier model Toyota 4SDK5 skid-steer loader, commissioned the new Huski 5SDK5 after securing a contract to move 140 tonnes of earth from a confined site for a major home renovation. 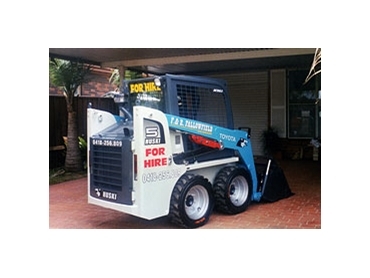 "You can see it in the strength of the Toyota skid-steer loader, the way the electrical wiring is protected inside the frame members, and the little design touches, like a hook to hang your jacket on. "The performance is very impressive - the Toyota 5SDK5 skid-steer loader has lots of power, good breakout force and pulls strongly”.